There is one card for every element on the Periodic Table. The card gives basic information about the element, including what it is used for. Each player is dealt a hand of six cards. 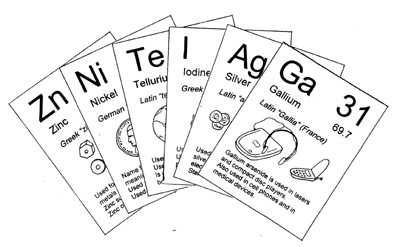 A “caller” calls out clues such as “An element whose name starts with the letter C,” or, “An element that is used in dentistry.” Then the players scramble to be first one to identify such a card in their hand. It’s a fast-paced game and can accommodate up to 8 players. In my experience, I’ve found that students will ask to play the game over and over again!